How many months do you need to prepare for your wedding? Some people just need 24 hours, some need more than 24 months... Getting married soon? Are you stress with all the planning and budgeting? 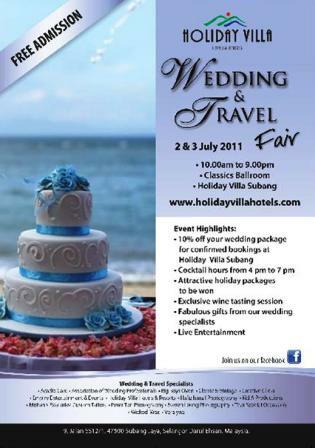 For those who are planning a wedding or a vacation, why not visit the Holiday Villa Wedding & Travel Fair which will be held on 2 & 3 July 2011 at the Classics Ballroom, Holiday Villa Hotel & Suites Subang. Organized by Holiday Villa Hotels & Resorts, this fair is the answer for couples who are going through the stress of looking for the dream gown, the best photographer, the perfect venue and the ideal honeymoon destination. It is a one-stop centre and you can find all that you need here. Admission to Holiday Villa's 2nd Wedding and Travel Fair 2011 will be FREE and opens from 10.00 am to 9.00 pm with over 20 exhibitors supplying wedding favours and stationeries, entertainment, wedding gowns and suits, flowers, wedding cake, photography and videography, wedding car, bridal make-up and holiday destinations. Now that's a whole lot of stuff being offered. The highlight of the event will be the cocktail hour from 4.00 – 7.00 pm. During this time, there will be a fashion show, entertainment, make-up demonstration and lucky draws. As the organizer, Holiday Villa Subang will be offering an attractive discount to anyone who buys their wedding package during these 2 days. 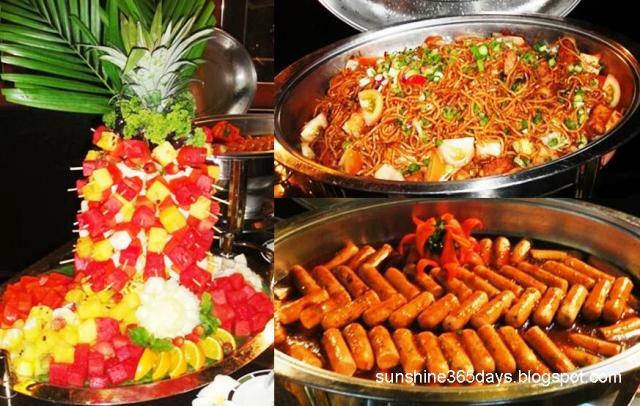 Holiday Villa Subang will be offering an attractive discount to anyone who buys their wedding package during these 2 days. Besides the wedding exhibitors, Holiday Villa Hotels & Resorts will be selling holiday vouchers for their resorts in Langkawi, Cherating, Bali, Phnom Penh and Halong Bay. Visitors who buy 5 vouchers will get additional 1 voucher for free. Exclusively for Facebook fans they will only have to buy 3 vouchers to get 1 additional free voucher. Fans will also receive extra goodies. The whole night was fun with delicious food, cozy room, nice entertainment and mingling with other bloggers. Plus non stop taking photographs.